GOVERNOR Leonard Gabas Mayaen of Mountain Province, who just celebrated his 63rd birthday on March 14, 2016, died on Friday after he suffered a cardiac arrest. The governor was serving his second term and was running unopposed in the coming May 2016 elections. Provincial Information Officer Angel Baybay said the governor was pronounced dead by attending physicians at the Notre Dame De Chartres Hospital in Baguio City where he was airlifted after receiving initial medical attention at the Bontoc General Hospital on Thursday, March 31. “Sketchy reports from the Provincial Security Office revealed that the governor was found lying down on the floor inside his bedroom at the Mansion House at 11 a.m. last Thursday by provincial security guard William Tagkitag who then alerted the Provincial Disaster Risk Reduction Management Office (PDRRMO),” Baybay narrated. Responding rescuers rushed Mayaen to Bontoc General Hospital but was transferred to Baguio City three hours later when a chopper from the Philippine Air Force arrived. 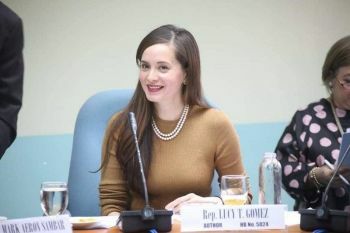 Baybay added that security guards assigned at the Mansion House, the official residence of the province’s chief executive, narrated that Tagkitag was to remind the governor that an official function at the PDRRMO was about to start when he discovered the governor had collapsed. In a text message from Mt. Province Representative Maximo Dalog, he said instead of the scheduled opening parade for the Lang-ay Festival on Friday, April 1, the Provincial Government offered a mass for the untimely demise of Governor Mayaen. Mayaen was born in Besao but his family moved to Mount Data in Bauko where his parents worked at vegetable farms. Coming from a considerably poor family, Mayaen has to earn his way to school. Dr. Allison Bellagan who once taught him at the Mount Data Elementary School remembered him as a timid and soft-spoken boy but could outdo his classmates academically. “He usually comes to class with his younger brother in tow but I really did not mind since he was doing good. He would cuddle his younger brother or carry him with a back strap when he sleeps,” Belagan said. Mayaen finished his elementary education as class valedictorian. Mayaen would do odd jobs just to earn something during his high school and college days. It was only when he began teaching while enrolled at the law school that he tasted the simplest luxuries of life. Mayaen resigned his teaching job at the Tublay School of Home Economics in 1980 to start his private law practice. Eight years later, he tried his luck in politics and won as board member of Mt. Province. In 1992, he was elected vice governor and won a fresh mandate in 1995. He was voted governor in 1998 but lost his re-election bid in 2001. Nine years later, he came back and reclaimed the governorship. His re-election attempt in 2013 recorded the most lopsided battle for the governorship in recent years. Being unopposed in the coming elections, he was to serve his third and last term as governor by July if not for his untimely death. His six years as vice governor earned dividends for the province. It was under his leadership that many positions in the Provincial Board were created and filled up. Together with now Bontoc Mayor Frank Odsey, he initiated the institutionalization of the Provincial Scholarship Program and caused the settlement of various inter-municipal boundary disputes. Baybay said that Mayaen will always be remembered as the pro-employee governor. “He did not only initiate the creation of hundreds of positions but, in coordination with the vice governor and members of the SP (Provincial Board), was also primarily responsible in giving all benefits to employees,” he added. “He is likewise known for his peace advocacies in settling disputes between and among tribes in the province. Many are still not aware but he put an end to a long-drawn tribal conflict by spending his own money to pay a financial obligation demanded by the aggrieved tribe,” Baybay added. It was also during Mayaen’s term the Provincial Peace and Order Council were awarded as the best PPOC in the whole country for three successive years. In his talk during the opening of the Lang-ay Festival Agricultural and Trade fair on Friday, Provincial Administrator Johny Lausan referred to Mayaen as the man with vision. “He has placed Mountain Province in the global map in terms of tourism, economic growth, peace and order, unity and excellence,” Lausan narrated.